How much do you know about the Redeemed Diviners? is going to ask you when you approach him and speak to him in the garden of Dalja. 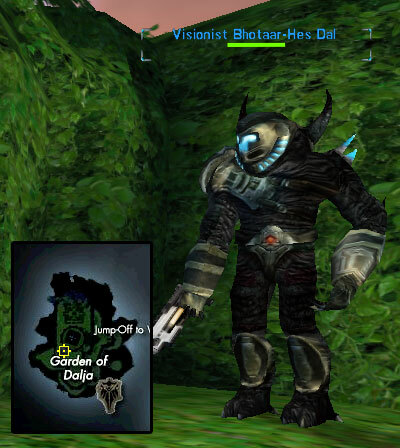 Show your Dalja Garden Key to the Visionist. He suggests that you hunt ghosts or spirits to find the blueprint for a demon. These drop from various mobs (see an in-progress list below). However, we hunted the Global Market Search quite quickly and picked one up there in only about 5 minutes time! 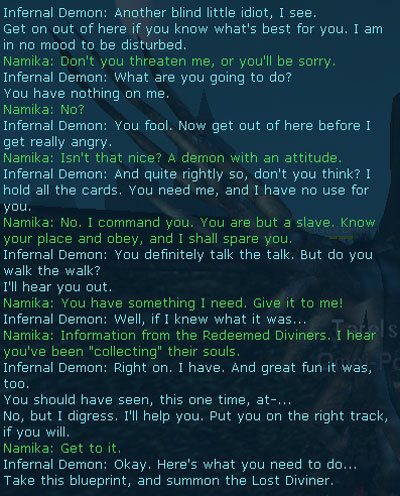 Note that only ONE person can get a key per Completed Blueprint, due to the fact that the Infernal Demon despawns when he finishes his conversation. When you have the complete pattern, Show the blueprint of the Infernal Demon to the Visionist (do not use novictum on it, as this part requires that you only complete the pattern). You should now get a quest update and the Visionist will tell you to summon the demon and get some information from him. You can then finish the process and make the pattern into a Novictalized Notum Crystal. Check our Pocket Boss Guide to learn how to complete the pattern. The process takes 400 Nano Programming and a really low amount of QFT, well less than 258 anyway! You can also ask a tradeskiller to do it for you. Take the crystal to a 160+ incarnator and activate the crystal (there is a lvl 170 incarnator northeast and a lvl 190 incarnator northwest from Adonis City South). At the end of the conversation, he will give you a Complete Blueprint Pattern of 'Diviner Gil Kald-Thar'. He will also despawn, preventing other people from completing this quest (only one Complete Blueprint Pattern of Diviner Gil Kald-Thar per person). Make this pattern into a Novictalized Notum Crystal (same process as with the previous complete pattern). The process requires, 900 Nano Programming and 675 FQP. Luckily you don't need to do the combine yourself, so just find your nearest friendly tradeskiller to help you if you don't have the skills! You can do parts of this quest and the Redeemed version in parallel. But please note that Record of Lost Diviner is Unique and will be consumed by the quest giver at the end. We therefore suggest that you hunt for two sets of pattern of the Infernal Demon and have four pieces of Novictum and Crystals Filled by the Source ready before you go to the incarnator. Then finish one quest first before the other. Information originally provided by Fei to the SL Library Forums. Additional notes for Neutrals added by Afreng.